Once again, this was written 2 days ago. Internet access at our new site seems much better. The weather has finally caught up with us and it’s raining today. Not much rain, but enough to make us change plans about taking MoJo the scooter out for a run. We opted instead for a lazy day and walked into the local village, La Carlota. This is quite an uninspiring, charmless kind of town and after walking the length of it twice and popping into the church, we opted for some bar crawling. The bars were also uninspiring but at least had alcohol and food. When we left our wonderful campsite in Sierra Nevada, the lovely manger gave us a bottle of our favourite ‘Puzuelo’. Clearly no-one had drunk 3 bottles of it before now!! It is a really lovely wine, we’ll save it Christmas. 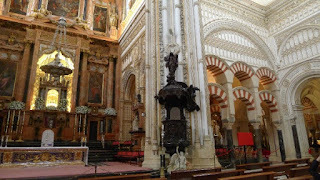 The last 2 days were spent in Cordoba. As usual the old part of town is interesting and fun to wander around and get a bit lost in. 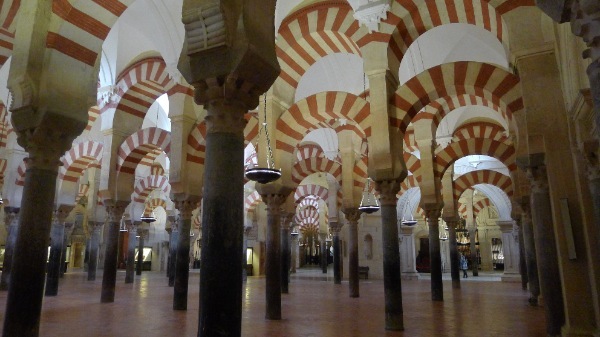 The key attraction of course is the Mosque “La Mezquita”. This must have once been one of the most beautiful buildings in the world, and still has a beauty that is hard to describe. Its loveliness is in its simplicity and repetition of arches and columns. Sadly, after the reclamation the catholic power brokers decided to build a typically over-the-top renaissance cathedral in the middle of it. Not content with that, they also added side chapels in the same style. If you look purposefully, you can almost ignore this aberration and see only the beautiful understated Islamic architecture. Carlso V was the dude who sanctioned this, albeit reluctantly, and when finished apparently stated “You have built what you and others might have built anywhere, but you have destroyed something that was unique in the world”. That sums it up. This, from the man who built his own palace within the grounds of the Alhambra. The Alcazar along with its formal gardens and royal stables were also lovely to see, but they wouldn’t let me ride the horses. The Alcazar now houses some lovely roman mosaics from the 2nd century. 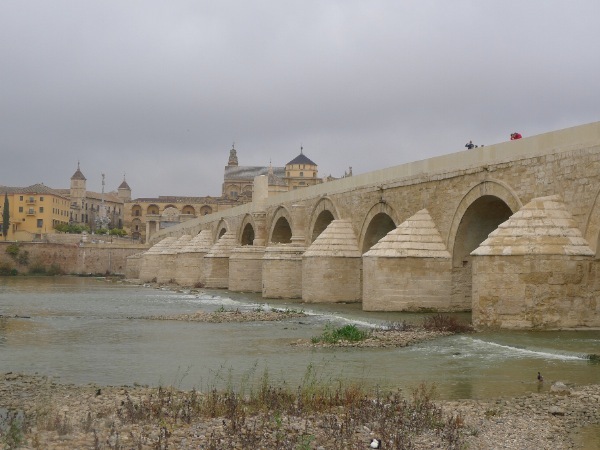 Typically for this part of the world there is a Jewish quarter with one remaining synagogue - the only other others still standing are in Toledo. Cordoba’s old city has the usual maze of streets with whitewashed houses directly on the street. I kept poking my nose in doorways etc because they all face onto beautiful courtyards, decorated with blue & white tiles and orange trees, which you can’t see from the street. I felt locked out of the best parts of the city. Hurrumph. 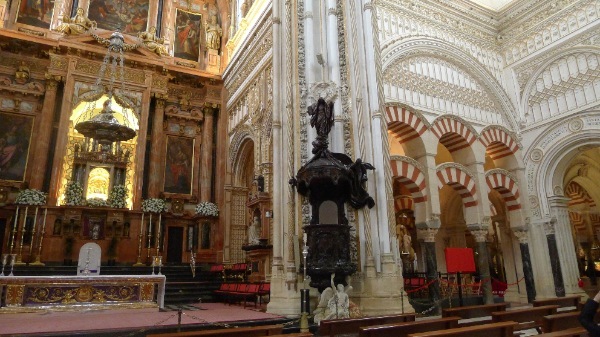 Tomorrow we head to El Rocio which is where we will be spending Christmas. It’s on the edge of a National Park “Coto de Donana.” The aim is to spend time walking and pottering around before heading to family in Bonn for NYE.